It's been quite a while since my last alphabet letter so I figure now is as good a time as any. I actually rather like the Dark [COLOR] outline filled with [COLOR]. I may want to do more like that in the future. Anyways since I is symmetrical I decided to make this one a chicken mirrored onto both sides. Also I'm working on a new secret project, for which I'll release some info soonish, so if there are any notable delays in my activity that project is the reason. Mind you, since I'm resuming the Alphabet so I should be able to maintain a good release rate. 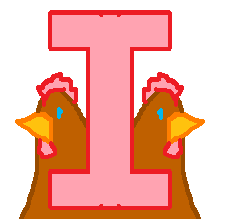 Of the whole Chicken Alphabet Series (as it currently stands), I like 'I' the best. It could be because it's pink but I think it's more the symmetry of the whole design. Bravo!, by the way. I never would have thought to build a blog around chickens. I already know I'll be back for more.